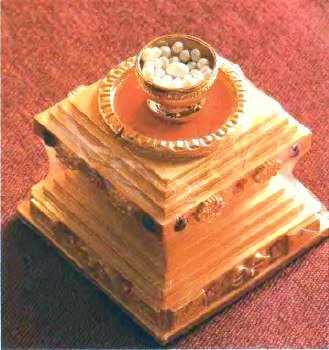 Buddhist relics. Photo by Nick Dawson. The benefits of seeing relics are great. Relics have the nature of primordial awareness comprehending emptiness and the aspect of pills, bones, and so forth. They are established by enlightened beings with great compassion. In the past, when Buddha was residing in India, many people saw his actual body. Nowadays, due to impure karma and lack of merit, we cannot see the body of Buddha nor hear his speech. We only have the fortune to see Buddha’s relics. Therefore, kind and compassionate Guru Shakyamuni Buddha emanated thousands of relics as an object of devotion for very many sentient beings.